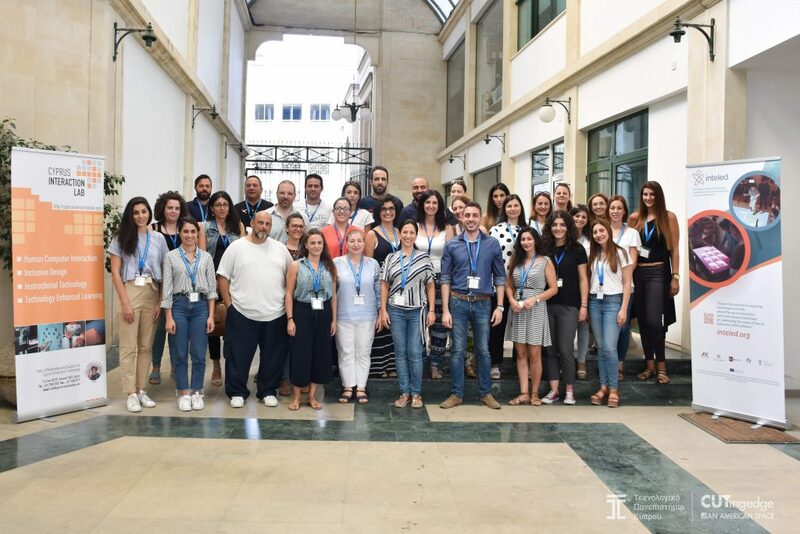 The INTELed Teacher Professional Development Programme (TPD) has been successfully enacted and completed in Cyprus, at the Cyprus University of Technology (CUT). In Cyprus, twenty-nine (29) special and general education teachers had a unique opportunity to participate in three (3), half-day training workshops, which aimed at supporting them in acquiring knowledge and skills about the use of multi-sensory and embodied technologies in inclusive educational contexts. During the first training workshop “Supporting teachers in acquiring knowledge and skills about the use of interactive and multi-sensory techniques for addressing the needs of Special Education (SEN) children”, which took place on October 6th 2018,teachers were introduced to the embodied learning pedagogy as a promising approach in creating equal educational and social opportunities, for students with disabilities. In addition, they explored a variety of embodied digital learning apps and games, taking the role of the learners. During the second training workshop “Apply and evaluate embodied digital learning apps and games using innovative and interactive activities”, which tool place on November 3rd 2018, the teachers worked collaboratively in teams in order to experience and evaluate: “The angle-makers” embodied digital app for learning in mathematics, “ The Young Cardiologists” embodied digital app for learning in science as well as the “KINEMS” suite of embodied educational games. Furthermore, a constructive conversation took place, during which the teachers discussed about how they could integrate more effectively multi-sensory and embodied learning technologies in their classrooms. During the third and final training workshop “Lesson plans implementation and evaluation based on Embodied Learning using innovative and interactive technologies”, which took place on December 8th 2018, teachers had the opportunity to develop a full lesson plan around multi-sensory and embodied learning technologies for promoting inclusive education in their classrooms. They, next, exchanged their lesson plans and received feedback from their colleagues. The workshop concluded with a discussion focusing on the potential opportunities and challenges that could emerge from the integration of embodied learning pedagogy and the use of multi- sensory technologies in inclusive educational settings. In Cyprus, the INTELed training programme has been organized and successfully delivered by Dr Andri Ioannou (Project Cordinator), Dr Yiannis Georgiou (Project Manager), Mrs Nicoletta Pantela (Research Associate) and Dr Panayiotis Kosmas (Research Associate).